1. Everyone already now thinks you’re crazy, you have nothing to lose. 2. 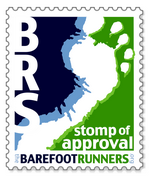 Someone has to show all those people wearing “barefoot shoes” what barefoot running really is. 3. Paying $100 for a pair of shoes still seems like a bad idea. 4. Your feet won’t fit in your old shoes anymore. 5. Shoes would feel like lead weights at this point anyways. 6. Still feels good to pass shod runners in races. 7. Every run is still a new adventure. 8. The question “Doesn’t that hurt?” has now been asked so many times that it’s actually funny at this point. 9. You’ve made at least a few other people’s lives (and knees) better by influencing them (not by preaching, but by modeling) to change to barefoot/minimalist running—maybe you’ll influence some more! 10. The older you get, the more shod runners will stop due to injuries, therefore the higher your ranking will be in race age-group categories. What are some of your reasons? Share them below!